I'm enjoying listening to nervous BBC presenters quizzing Sir Michael Lyons about the BBC Trust's determination to publish the names of the talent who get most money from the corporation. Jeremy Clarkson is no doubt paid a small fortune and he probably makes sure that his remuneration is organised in as tax-efficient a way as possible. So would you. Now that Ross is leaving the BBC Clarkson will be the whipping boy, the first about whom we'll be asked to decide "is he really worth that much?" I don't know what the sum is but if any TV presenter is worth it I reckon Clarkson is worth it. Lots of people, me included, will watch anything he presents. (Full disclosure: I've no interest in cars.) He probably writes his own links, which is more than can be said about 90% of TV presenters. There is a sign, in everything he does, of a mischievous intelligence at work. He's got that energy which is the most important thing broadcasters need. He's a genuine TV star in that even when things slightly misfire you have to watch the way he slightly colours up. He's human in a way that your standard autocue reader isn't. James May and Richard Hammond are perfectly good at what they do and very famous as a consequence of it but they're not genuine TV stars. 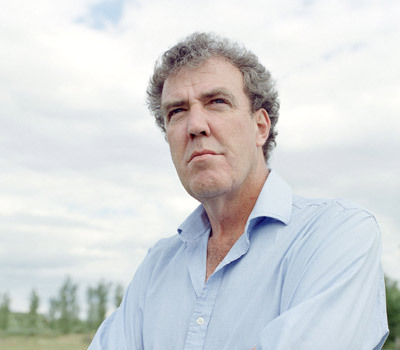 If Clarkson went to ITV or Channel Four he'd take a lot of his audience with him. There are a lot of people who are likely to calculate their value for money from the licence fee in terms of how much Jeremy Clarkson it gets them. This is a fact, whether sophisticated opinion wishes to believe it or not. But just because Clarkson is worth it, that doesn't mean that most TV presenters are also worth it. I suspect the BBC pay Clarkson-type money to a number of well-known faces who don't write their own links, are entirely the creatures of their producers, do very well because they're in the right slot at the right time and wouldn't take much of their audience with them if they moved. I wonder whether that's behind the implication in Sir Michael Lyons' interview this morning that the public might be surprised who's in the top band and who isn't. I do believe the success of modern Top Gear, which Clarkson created, is the BBC's biggest single programming earner, due to its repetition around the world and the spin-off products (such as the magazine and live shows) that it carries. The opinion of Top Gear influences car manufacturers everywhere - that may not make money for the BBC, but it gains an element of prestige that few other shows or personalities elsewhere in the corporation could match. And Clarkson writes the script for every programme. He famously claimed to be writing the next edition of Top Gear in his office at home when he heard that the programme had won an Emmy. The fact was that he was writing an episode in the Cotswolds, not basking in the glory of the programme's success somewhere star-filled in the USA. I think James May is almost as starry, though. Richard Hammond to me is the weak link on Top Gear, but that's the view of a churl because as weak links go, he's still pretty strong. I should add that there is one reason Clarkson may evade criticism of his salary from the anti-BBC press - he works for Murdoch and hold similar (albeit exaggerated for effect) political views to Dacre. I'm sure I read over the weekend that Clarkson's production company made £2m last year, of which half was returned to BBC Worldwide. And I too recall the Emmy incident - I believe it was for "Non-scripted" show, and they made big play of him writing the script for the next few weeks. I just wish more of his books were original, rather than compilations of columns, as when he does expand on a topic the results can be fascinating. I agree with the previous caller. When Clarkson went on the hustings with A A Gill during the campaign trail, he not only gave witty and concise copy but, got to the very nub of phoney baloney modern politics. He doesn't stand on ceremony. He doesn't doff his cap to anyone. And he doesn't give a flying f*** what his critics think of him. I think that Clarkson suggested the format of Top Gear (in this incarnation) to the BBC so no doubt has the intellectual property rights (and benefits as a result of huge international success) that goes with it. As such, he is bound to be top of the tree and no bad thing in my view. Although my wife can't abide him. My wife is in front (or behind) Blackacre's in the queue - she hates the man. I have to say I'm not sure I actually like him but can't deny I watch the TV that he makes. Given I have very few shows I "seek out" that is saying something. Who is worth what is always a mute point - I'm in a job currently (well until next Wed when I leave) that pays me more than a teacher or a nurse. Is that fair? Is that right? Who knows but it is the reality of the world today. Too many people will bemoan that someone is paid this or that - well stop watching the programmes and that will stop the money simple really. Personally, can't bear Clarkson. BBC3 I find awful. However, I'm not sure whether examining the value of individual stars is rational. Naturally, we can't like all the BBC output, so shouldn't we be considering what we as a unique consumers get out of it for our licence fee. Top Gear, Doctor Who, both big earners for the BBC in terms of merchandise, international sales, spin-offs etc. I've often wondered how many action figures and international sales went off the back of Jonathan Ross.